Anyone have a video, pics or tips on replacing front crank seal on a 91-Z? Also, anything besides dampner puller & reinstall tool needed? Anyone ever use AT-205 polymer sealer with success? Thx! It is not easy to get the seal out & back in without distorting the timing cover or seal, or otherwise causing a leak. MUCH smarter to bite the bullet and just take the TC off. I'd suggest also, make sure that there's a bolt in this hole in the front of the block, before getting all wound up in messing with the seal. If there's not one there, put a short one in there, with a drop of sealer on the threads. 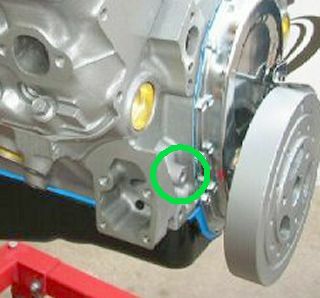 If you do end up changing out the front seal, no sealer is "necessary", since the seal is coated with some kind of rubbery … stuff; although it sometimes helps to put a bit of RTV in the very bottom of the seal bore, such that when the seal goes down into there, the edge of it is embedded in the sealer. And, the usual reason one of those leaks, is because the damper has a groove worn in it, which if that's the case, no amount of changing the seal will fix it. You'll need a new one. Not to worry though, they're not too $$$. Other than that, it's a small block Chevy; same as any other from 55 to 2000. Do NOT put foreign substances in your oil. It's not going to seal up a cracked seal or a grooved balancer. Do it right. Pull the exhaust, the pan, and replace the timing set, cover (with seal), balancer, etc. All that stuff is ancient. The rubber in the balancer is 30 years old! It's all garbage. And the parts are cheap. Crank, start, run, shutoff, no run, wait, crank, cough, crank run!